Though I’ll probably end up talking about the amazing food served at the Public House in a later post, this one is dedicated to the beer. For the uninitiated, I recommend ordering a flight at a brewery. This gets you a sampler of usually between four and six of the different beers they brew. In Rogue’s case, you get four. Whenever you go to a new brewpub anywhere, you should order a flight so you can really get a flavor of their offerings. It’s also a great way to discover what kind of beers you like (and don’t) by trying a little of everything. 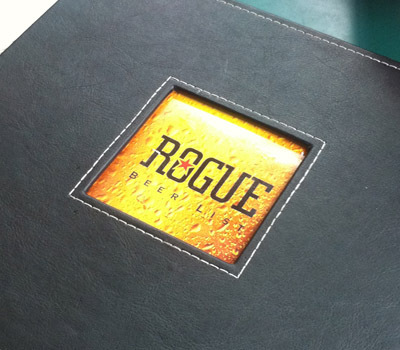 When you’re talking about Rogue beers, the flight is almost mandatory – they brew a mind-bogglingly large variety of beer, and, to prove it, the Beer List is actually a bounded book with full descriptions of each one of their family of wonderful brews. With the Public House having 36 different beers on tap at any one time (check out Rogue’s Release Schedule here), you’re not going to taste everything they offer at a single sitting by drinking a pint of each (though I’ve fantasized about trying). In fact, even the flights will leave you flying high if you have more than two. Added benefit, the airfare is pretty cheap at $6 a flight. Though you can choose which beers you’d like to have in a flight, I prefer to trust the expertise of the waiters and waitresses of the Public House which results in some fascinating choices. For this trip, we ordered two random flights from two different members of the staff. Our waiter wasn’t messing around. For the first random flight, he selected the Chocolate Stout (one of my personal all-time favorites), Honey-Orange Wheat, Yellow Snow and Pumpkin. The Chocolate Stout is always awesome with a particularly strong sense of chocolate that doesn’t overwhelm. You have to be a fan of stouts in order to enjoy it, but I always am (possibly because it’s ironic given that I am not stout myself). The Honey-Orange Wheat was quite nice with a great flavor and easy drinkability. The Pumpkin was surprisingly subtle. I’m used to pumpkin ales being almost overpowering with pumpkin flavor which doesn’t really bother me seeing as how they’re also usually seasonal beers. If you’re gonna order a pumpkin beer, be prepared for pumpkin flavor (much the same way I feel about hanging out in Southeast – if you’re gonna hang out in Southeast, be prepared to smell humanity in all its forms). Rogue’s Pumpkin only carried the slightest hint of pumpkin. In fact, I was almost a little disappointed. Yellow Snow was my least favorite, but that’s simply because I’m not a fan of particularly hoppy beers. A Jack Russell terrier that’s been fed a gallon of Stumptown Coffee’s espresso and then peed on an electric fence would meet its match hop-for-hop with this beer. Our second flight was selected by a delightful waitress who happened by our table, and here’s what makes Rogue so amazing: she picked nothing but reds. 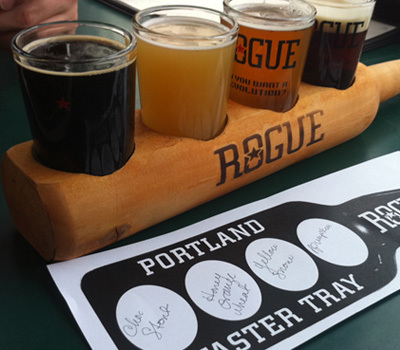 True, going with all of one kind of beer takes some of the fun out of a random flight, but what astounds me is that Rogue brews so many beers that you can build a flight of the same type (even if it’s only four beers). Most breweries have one – maybe two – varieties of a type. Four? For me, Cap’n Sig’s Northwestern and the Chatoe Rogue Wet Hop ales both blended together – both quite good, though I’m not sure I’d order them on their own. The XS McRogue Scotch Ale won me over for this flight with a great flavor that went down smooth. The surprise was the Chipotle Ale. Unlike its Pumpkin brother, the Chipotle Ale isn’t kidding around – it brings a little spice to the party. Though I can handle spicy foods now and then, I typically prefer tamer flavors so that might give you an idea of how spicy – I’ve had far stronger (and those, in my opinion, are far worse because of it). The Chipotle was incredibly enjoyable to drink and the extra pepper flavor added a bit of novelty to it. Would I drink a pint? Sure, but not on a regular basis. 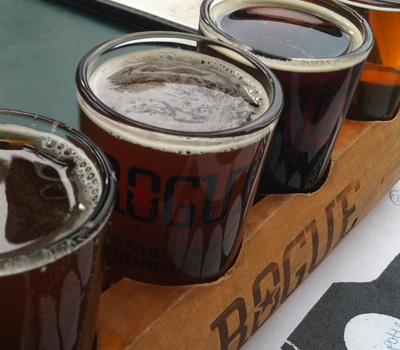 Almost everyone can find something at the Rogue Distillery and Public House, even if they don’t care for beer. 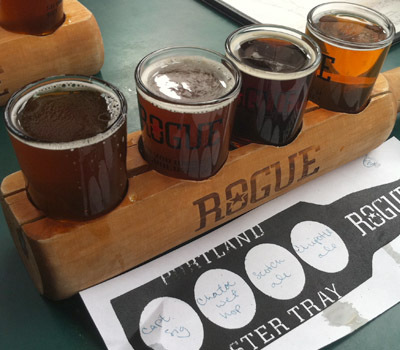 If you are (or know) a beer lover, then you need to go to Rogue, especially if you’ve never had the pleasure of drinking one of their fine, fine beers – or take a flight for four at a time.